How to describe these???? slices of heaven, gastronomic bliss, or perhaps the best frigging breakfast in the world; yeah that sounds right. These are to die for, or should I say hop out of bed faster than a speeding bullet for. I baked 13 of these guys Saturday morning and while I tried my hardest to limit myself to just 1/2 of one I ended up eating 1.5 as soon as they came out of the oven. I took five to work, Brian’s brother ate one, and by Monday morning Brian and I had taken care of the rest, and all I could think about was making more. 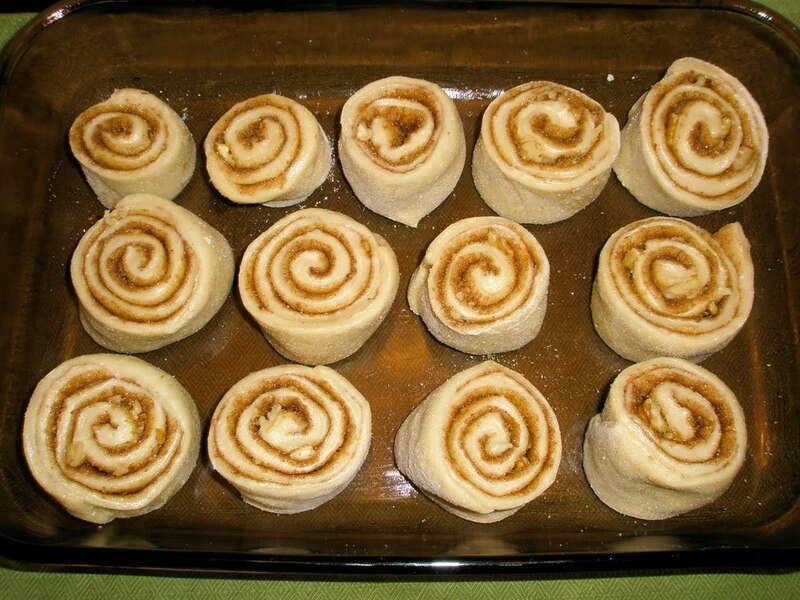 I have made cinnamon rolls using a few other recipes and I have never had a bad result, but the one thing I always found problematic about other recipes was that they took several hours to make. In order to enjoy them for breakfast you would either have to wake up before sunrise or make them the day before and reheat. 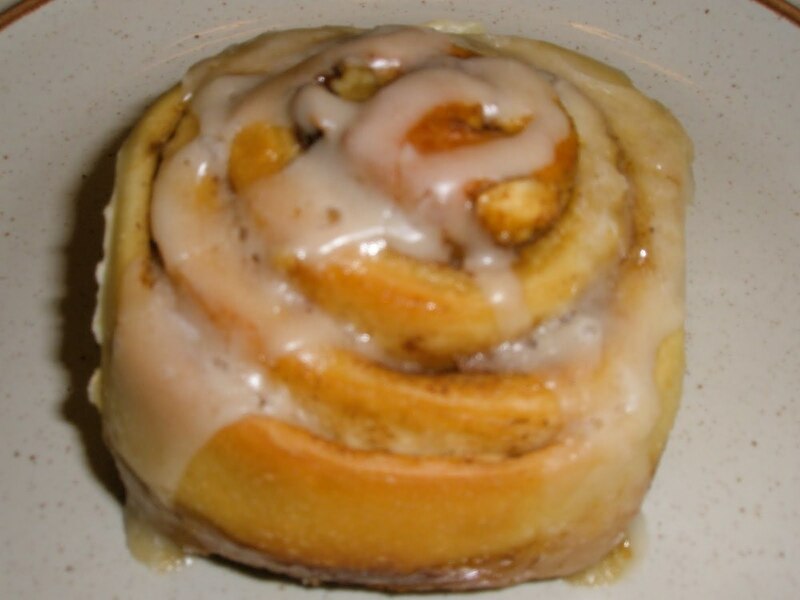 I knew there was a better way though; I envisioned a world in which you could sleep in and indulge in fresh cinnamon roll bliss. That’s where today’s recipe comes in to play. 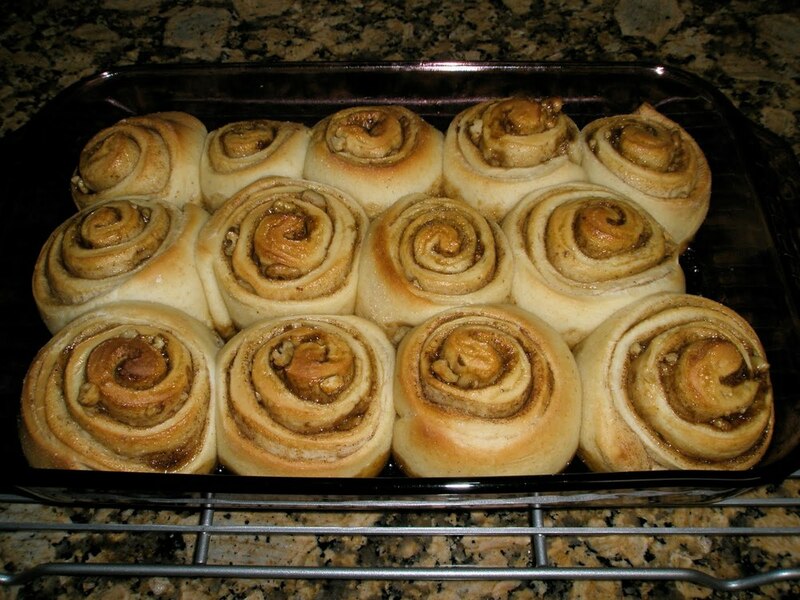 These guys go through their final rise overnight in the refrigerator, and their sweet cinnamony scent is ready to waft out of the oven towards your nostrils as you do your morning stretching. Now apart from the temporal convenience of this recipe these rolls are also quite tasty. The dough is light and subtly sweet, the filling is spicy, and incredibly alluring, and the frosting adds the final decadent touch. So here’s the game plan; around 8 tonight gather your ingredients and put these together. 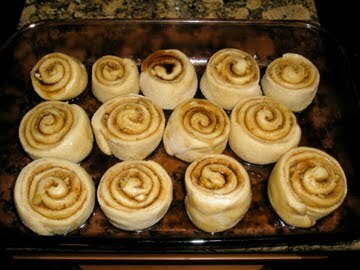 In the morning pop them in the oven and then get ready for your day. Then just as your finishing your morning routine you’ll detect the scent of heaven itself coming from your kitchen, and will shortly sit down to the most mouthwatering breakfast that you could ever dream up. Deflate the dough and turn it out onto a lightly floured surface and roll into a 10x 14 inch rectangle. Lightly brush the far edge with water and KEEP CLEAR of filling ingredients. Brush the remaining surface of the dough with melted butter. Sprinkle a light coating of cinnamon over the dough; enough so that the whole surface is covered but not so much that there is a film. Next sprinkle with brown sugar. Then sprinkle the raisins and chopped nuts over the dough. Roll up into a log and seal the seam (the edge that you prepped with water). Cut the dough into 12 equal pieces; place the pieces in a greased 9×13 inch baking pan, or 12 inch deep dish pizza pan. Cover over with plastic wrap and place in the refrigerator to rise overnight. The next morning, take the rolls out of the refrigerator and let stand at room temperature while you preheat the oven to 375 degrees. Remove rolls from oven and place on cooling rack. Immediately drizzle with frosting; If frosting has hardened a bit microwave for 15-30 seconds, stir, and then pour over rolls. Serve to family friends and of course yourself, and watch the food orgasms unfold.